Welcome to the Colorburst Studios on-line catalog! 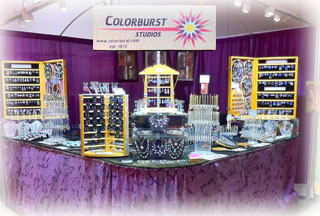 This is a catalog of the eye-dazzling handcrafted Niobium Jewelry by Colorburst Studios, a small family business headed by artist Paul Crabtree. We personally handcraft all the work you will see here. Our designs are grouped by categories that loosely categorize their mood or meaning. Niobium is one of the lightest of metals for jewelry there is, so all of these designs are quite comfortable to wear. Earrings all come standard on our own handmade Gold fill earwires. If you are one of those people who have allergy problems, we also make Niobium earwires, which are totally non-allergenic, and we offer to hang any of our earrings on these at no extra cost, you just need to specify Niobium earwires when ordering. All designs are copyright Colorburst Studios. You may have seen me at an Arts and Crafts fair near you at some time, I have been in business and doing juried shows for nearly 35 years.You can now purchase some of my work through this online catalog...please do take a look! Use the navigational controls on the left to get around the site.